A nosebleed, also called epistaxis, is a loss of blood from any blood vessel in the nose. It usually appears in only one nostril. Although unexpected or persistent bleeding from anywhere is a warning sign of cancer and should be investigated, nosebleeds are rarely a sign of serious illness. They are usually the result of minor injury or irritation. 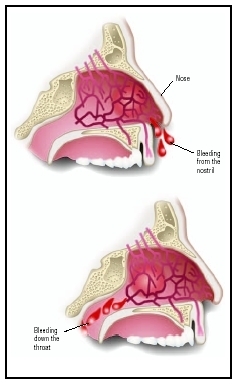 Nosebleeds most often come from the front of the septum, the cartilage that separates the nose into two nostrils. These anterior nosebleeds comprise 80 percent of all nosebleeds. A mass of blood vessels, called Kiesselbach's plexus, lie on either side of the septum. These blood vessels are easy to injure and bleeding can occur. Posterior nosebleeds, which come from the back of the nose, are less common and much harder to manage. Bleeding usually begins in the upper part of the nose and flows toward the throat and mouth where it is swallowed. It is difficult to determine how much blood is lost in these nosebleeds. Though it is a common misconception that children are more susceptible to nosebleeds than adults, research has found that nosebleeds are more prevalent in older adults and more often are a sign of other health problems. Nosebleeds do, however, occur frequently in childhood. About 30 percent of children up to five years of age have had spontaneous nosebleeds that appeared without apparent injury to the nose. Of children six to ten years of age, 56 percent have had them and 64 percent of preadolescents and adolescents from 11 to 15 have as well. Moreover, over half of adults with recurring nosebleeds had them as children. Only about 10 percent of children with frequent nosebleeds have been found to have a previously undiagnosed bleeding disorder. Rarely, menstruating women, even adolescents, who have endometriosis, a condition in which tissues resembling the lining of the uterus occur abnormally in other parts of the pelvic cavity and sometimes in other parts of the body, can have cyclical nosebleeds with their menstrual periods. The most common cause of nosebleeds is injury from picking or blowing the nose. People with respiratory allergies , hay fever, and sinus infections have swollen nasal membranes that are fragile and more likely to bleed. Physical injury to the nose from falls, sports , or fighting can also cause nosebleeds. Chemical irritants such as cleaning products, aerosols, and paint can irritate the nose, sometimes resulting in nosebleeds. In addition, some drugs, such as cocaine, inflame the nose, causing it to bleed. Children with deviated septums or crooked noses are also prone to nosebleeds. Nosebleeds occur more frequently in the winter when the air is cold outside and homes are filled with dry air from furnaces and other heating sources. Changes from cold to warm air or dry to humid air stress the delicate membranes of the nose and make it vulnerable to injury and bleeding. Also, flu, colds, and other respiratory illnesses seem to occur more often in the winter. These also stress the nasal passages and make injury more likely. Bleeding from the nose, therefore, usually follows these seasonal stresses. A nosebleed can also be an indication of illness. Certain blood disorders, such as hemophilia , can cause the nose to bleed. In this case, medical help should be sought immediately. Some head injuries produce nosebleeds. Uncontrolled high blood pressure, liver disease, leukemia, and tumors of the nasal passages and the brain can also cause the nose to bleed. Even some medications can cause nosebleeds. Anticoagulants, medications used to thin the blood, including aspirin, can cause spontaneous bleeding from the nose. Overuse of nasal sprays can also produce nosebleeds. In addition, nosebleeds can be a side effect of alcohol abuse. Nosebleeds in children can sometimes be caused by children putting objects into their noses. The object can tear the delicate membranes of the nose. Objects inserted into the nose can also cause obstruction of airflow and may need to be removed by a doctor. Bleeding from one or both nostrils may be a trickle or a flood. Sometimes, it accompanies direct injury to the nose as in a sports injury or in picking the nose or too vigorous nose blowing. Children may experience frequent swallowing or a sensation of fluid in the back of the nose and throat. If the bleeding does not stop after 20 minutes, it is necessary to seek medical help. Also, if there is a known or suspected head injury accompanying the nosebleed, there may be a skull fracture or brain disorder. In this case, the child should be taken to the emergency room immediately. In addition, if the nose is misshapen, especially after an accident, fall, or injury, it may be broken and will need to be evaluated by a doctor. Frequent nosebleeds, especially if they are occurring more often and are not due to colds, allergies, or trauma, will need to be seen by a doctor as well. It may be a medical emergency if the bleeding is rapid or if there is a lot of blood. If the child feels faint or weak during a nosebleed, it may be do to blood loss and the child should see the doctor immediately. Bleeding from the nose is the obvious determinant of a nosebleed. The severity of it, however, may require blood work to look for bleeding disorders, diseases of the blood, or infections. X rays may be taken to determine if there has been a head injury or abnormalities within the structure of the nose. To further examine the nose, the doctor may perform a nasal endoscopy, a procedure that involves inserting a tiny camera into the nose to look at blood vessels and nasal structures. The first line of treatment is to gently pinch the nostrils together with the thumb and forefinger, while sitting upright and breathing through the mouth, for five to ten minutes. Leaning forward will prevent the child from swallowing blood. After at least five minutes, the parent or child can check to see if the bleeding has stopped. If it has not, then the pinching of the nose should be resumed and the child or parent should wait another five minutes. Most nosebleeds will stop within this time period, especially if the child is encouraged to remain calm. Anxiety or panic will cause blood to flow more rapidly and can hinder this self-healing process. It is very important for the child not to lie down while having a nosebleed. Sometimes, a cold compress or crushed ice in a washcloth or plastic bag can be placed across the bridge of the nose and cheeks to encourage clotting. It is important not to pack the inside of the nose with gauze since this might further injure the nose. In 2004, a new over-the-counter product was introduced for a quick home treatment for simple nosebleed. Called Nosebleed QR (Quick Relief), the product is composed of a hydrophilic polymer, a synthetic powder that absorbs blood, and potassium salt that aids in scab formation. The parent or child sprinkles the product onto a swab and coats the nostril then pinches the nose for 15 to 20 seconds. The product stops bleeding within one minute. However, it does sting and may not be a comfortable product to use with children. Estrogen cream, the same preparation used to revitalize vaginal tissue, can toughen fragile blood vessels in the anterior septum and forestall the need for cauterization. Botanical medicines known as stiptics, which slow down and can stop bleeding, may be taken internally or applied topically. Some of the plants used are achillea (yarrow), trillium, geranium, and shepherd's purse ( Capsella bursa ). Anatomical sideview of a nosebleed. Homeopathic remedies can be one of the quickest and most effective treatments for nosebleeds. One well known remedy is phosphorus. Another natural treatment includes swabbing the nose with vitamin E oil for three days. If nosebleeds recur within that time, it is recommended to take 500 mg of bioflavonoids twice a day. Bioflavonoids are antioxidants found in citrus fruits that help strengthen blood vessels. Most common nosebleeds are easily managed and can be prevented. Children usually recover quickly. Serious nosebleeds need further investigation but are usually controlled by treating the underlying cause. Keeping the home cooler in winter and using a humidifier help keep the nasal passages moist and reduce the risk of nosebleeds due to dry air. Some doctors also recommend using a nasal saline spray to enhance moisture in the nose. Also, before sending children out to play on cold, dry days, parents can put a bit of petroleum jelly on a cotton swab and wipe it just inside their children's nostrils. This keeps the nose from drying out and producing surface cracks which can damage blood vessels in the lining of the nose and cause bleeding. Some parents routinely apply a thin layer of A & D ointment, petroleum jelly, or a mentholated salve around their children's noses at night as well as when they go outside. Deviated septum —A shift in the position of the nasal septum, the partition that divides the two nasal cavities. Hemophilia —Any of several hereditary blood coagulation disorders occurring almost exclusively in males. Because blood does not clot properly, even minor injuries can cause significant blood loss that may require a blood transfusion, with its associated minor risk of infection. Kiesselbach's plexus —The mass of blood vessels on either side of the septum. Nasal endoscopy —A procedure that involves inserting a tiny camera into the nose in order to look at blood vessels and nasal structures. Otorhinolaryngologist —An ear, nose, and throat specialist. Gently blowing the nose and not picking it will also prevent nosebleeds. This is especially important for several hours after nasal bleeding has stopped. In some cases, strong sniffing is also discouraged to reduce further stress on the delicate tissues of the nose. Keeping the mouth open when sneezing can also reduce stress on the nose. Treatment of hay fever and other respiratory allergies decreases sneezing and nasal inflammation. If a child is prone to sinus infections, some doctors may also use prophylactic or preventative treatment similar to allergy management. Nosebleeds can be frightening for children. Seeing any amount of blood may cause some children to panic or even faint. It is important to treat the nosebleed matter-of-factly as any parent would handle any other childhood scrape or wound. The parent's calm helps the child remain calm while waiting for the natural blood clotting mechanisms of the body to work. Parents should also be aware of any abnormal amount of blood during a nosebleed and make note of any recent falls or head injuries. These observations will inform parents about when to seek medical or emergency help. "A Natural Solution for Nosebleeds: I Get Frequent Nosebleeds. Will Taking Bioflavonoids Help?" Natural Health 33 (April 2003). "Dabbing That Bloody Nose." Pediatrics for Parents 19 (December 2001): 5. "Nosebleeds Are Nothing to Sneeze At." Nutrition Health Review (Fall 2002): 6. Pouliot, Janine S. "Nosing around for a Remedy." Better Homes and Gardens 82 (February 2004): 222. "Quicker Relief for Nosebleeds." Consumer Reports 69 (February 2004): 45.